The FGFA is equipped with revolutionary fully integrated avionics, with a high level of control automation and intelligent support for the crew. Joint Russian and Indian developers of the Fifth Generation Fighter Aircraft have agreed to reduce costs to develop the aircraft by around 40%, so that the two governments will invest $4 billion each over the next seven years, an Indian daily newspaper reported. 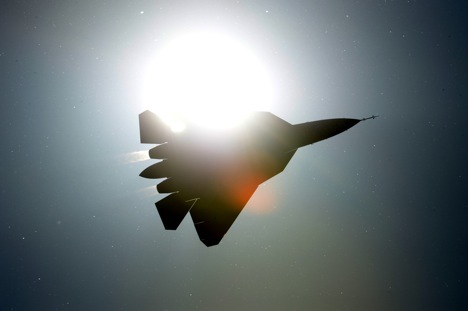 India and Russia have agreed to reduce the costs of jointly developing a fifth-generation fighter aircraft (FGFA) by 40%, to $4 billion from each side, India's Business Standard newspaper reported Monday. The newspaper said it was estimated in 2008 that the project would cost the each country $5.5 billion each, equivalent to around $6 billion today, accounting for inflation. However, the BS report continued, India's Hindustan Aeronautics Ltd (HAL) and Russia's Sukhoi (part of the United Aircraft Corporation (UAC)), developers of the FGFA, have agreed to reduce development costs by 40%, so India and Russia will invest $4 billion each over the next seven years. The two partners will invest $1 billion each in the first year after the research and development contract is signed, followed by $500 million each annually for the next six years. The proposed new R&D contract is expected to be approved by the Defence Acquisitions Committee, a special committee of the Indian Ministry of Defence, and then by India’s Defence Minister, Manohar Parrikar. RIA Novosti has not had any comments on the matter from Sukhoi. Defence Minister Parrikar said at the end of July 2015 that India had invested almost 15 billion rupees (about $230 million) in the joint programme to develop the FGFA with Russia. According to him, the preliminary stage of the project was completed in June 2013, and the next stage will start once the R&D contract has been signed. According to the proposed contract, deliveries of the FGFA to the Indian Air Force should start 94 months after the document has been signed. Russia's PAK FA has a number of unique qualities, combining functions of an attack aircraft with those of a fighter jet, and has unprecedentedly low visibility on the radar, optical and infrared spectra. The FGFA is equipped with revolutionary fully integrated avionics, with a high level of control automation and intelligent support for the crew. According to the development schedule, full-scale production of the aircraft is to start in 2016; flight testing is currently taking place. Only one country in the world now has FGFAs: the USA, with its F-22 and F-35 jets.